In signing the bill restoring unemployment benefits to 2 ½ million Americans jobless for more than 26 weeks, President Obama is also adding $34 billion to the deficit and the National Debt. That's the reason nearly all Republicans voted against the measure. They wanted the cost of the benefits paid for with unspent government funds or by other budget cuts. The White House dismissed GOP concerns as partisan game-playing. In two speeches over the last week, Mr. Obama argued that in the past, presidents and Congresses of both parties have treated unemployment insurance for what it is: an emergency expenditure. "Suddenly, Republican leaders want to change that," he said. He portrayed Republicans as hypocrites for demanding that jobless benefits be paid for but not applying the same standard to their call for an extension of Bush Administration tax cuts that will expire this year. "So after years of championing policies that turned a record surplus into a massive deficit, including a tax cut for the wealthiest Americans, they've finally decided to make their stand on the backs of the unemployed," the president said last Saturday in his radio/internet address. But Republicans were quick to remind Mr. Obama what he said after signing a previous extension of unemployment benefits on November 6th of last year. 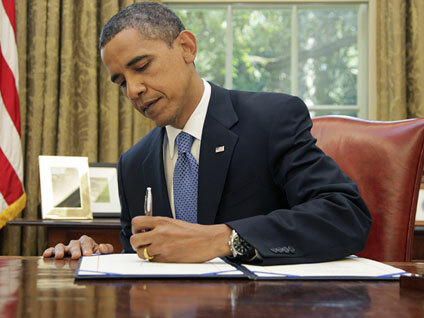 "Now, it's important to note that the bill I signed will not add to our deficit. It is fully paid for, and so it is fiscally responsible," he said. So eight months ago, he said paying for the benefits was the right thing to do, but now he sees no need to do so. Asked about the contradiction, White House spokesman Robert Gibbs said he needed to examine what Mr. Obama said last November and would get back to this reporter. He didn't. But the issue will come up again just after the midterm elections. The bill signed today extends unemployment benefits only through November 30th. So there'll be another go-round on the same issue just around Thanksgiving.